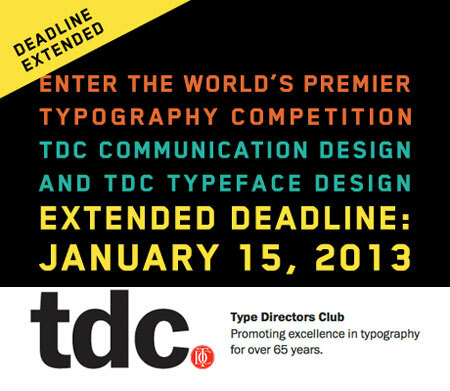 I am very honored to be one of the judges for the 59th TDC Annual International Communication Design competition, TDC59. The judging will take place in New York in January 2013. The yearly competition organized by the Type Directors Club has been an internationally acknowledged event for promoting the best typographic work from around the glob. This year’s judges include apanel of distinguished designers including Rietje Becker, Andrew Byrom, Aaron Draplin, Irina Lee, Craig Ward and Alyce Waxman. I am proud to be involved as a judge in the Type Director’s Club competition, especially after being a previous winner of this competition by receiving the TDC’s Certificate of Typographic excellence few years back. I highly recommend every designer to submit their best work produced in 2012 to the many categories of the competition. It is wonderful opportunity to give good design and typographic work a valuable international exposure. Details on submitting work can be found on the following link of the TDC website. Other international competitions that I have been in the past on their jury panel include the Adobe Design Achievement Award in the United States and the Magdalena Festival in Maribor, Slovenia.